Your Kids Are Losing Ground Right Now! Unfortunately this is happening across the country as we speak. Some students are moving ahead, some are falling further behind. Some students are on vacations, traveling and gaining valuable learning experiences. In fact, when I first started coaching high school baseball in Florida at a private school while finishing up college there were several students who traveled to the historical sites they would be studying in the upcoming school year with their families. Yes, this was World History so they pretty much globe hopped over the summer. This is great for them, but does it mirror the experience of the vast majority of students? Not in most places for sure. We know many, many more students are sitting at home right now on their summer break. There is not much reading going on or outside educational opportunities. Each summer these students fall further and further behind. Interestingly enough, students living in poverty generally gain more academic ground than their more affluent peers during the school year. However, these gains are critically hampered each summer. It is a cycle that has severe lasting implications. We all know the reality so what can we do? There are many steps schools and teachers can take to minimize summer learning loss in reading. A large study was done in Florida where students were given 12 books that they got to choose each summer for three years. At the end of the three years of receiving these books it was as if they attended a full summer program each summer. The interesting part of this is that all the researchers did was provide the books. No tutoring, no book clubs, nothing. That is it. I hope this gets duplicated across the country. Other research shows that summer learning loss can be prevented by students reading 5 books over the summer. We can address this as well as schools. What are we doing to encourage our kids to read over the summer? Providing a summer reading list? Well, that will work for a few students but let’s not fool ourselves into thinking it is helping most students. Some will trudge through the required summer book, jot some things down on paper and learn to hate reading even more. Some schools are starting to allow kids to choose their own summer books. Is this as neat and clean as all kids reading a book or two from a set list? Of course not, but it is more effective. In a time where funding for summer programs is non-existent in many districts what can we do? Can we work with our local community to help provide books for students? Can we use Title 1 funds to purchase books for students to keep? Purchasing books, allowing students to choose their book, letting them keep the book and designing supports for students has powerful potential. There is research out there that supports this – and the research is growing all the time. Our challenge to you is to do something. 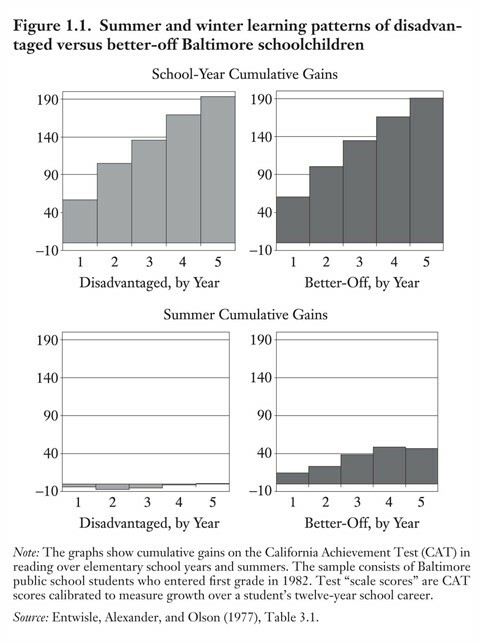 Summer learning loss is real and your students (most of them) suffer each summer. They make awesome gains during the year only to lose ground during their time off. 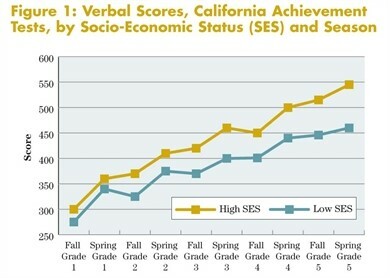 While students in the middle and high income groups fare much better, your students living in poverty suffer. Is this fair? Is this something we can attack? We think we can.